BELIZE CITY, Tue. Apr. 28, 2015–They say we are a product of our environment, but Alexander Alvarado is living proof that that statement is not always true. Growing up in a neighbourhood which had a lot of crime and bad influences, he made a change. At the age of 17 he was going through some problems in his life, and he said he always told himself he wanted to be different than the youths in the area that were into gangs. It so happens that one of his good friends, Timothy Mena was involved with track and field, and told him to come out to run and train and you will like it. He decided to go, and there he met a coach, Mr. Morris. He started training, and in that same year, at the age of 17 in 2010, he ran his first race. It was the UWI 10k. It was held on the Marine Parade circuit, and he took first place. Thereafter, they had the Alpheus Williams 5k, and he also placed first. That was when he met legendary long distance runner, Joseph Carr, who he said taught him everything about running and trained him; and Joe’s wife, Shelly Carr also played an essential role in his running development. 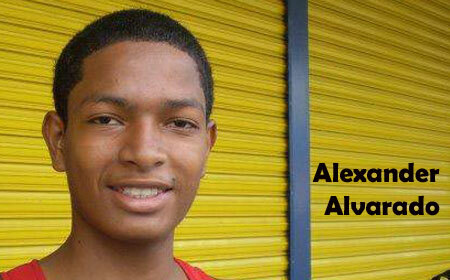 2011-2012 he got a chance to represent Belize at the Junior Championships in San Salvador. He did well in both years. 2011 also saw his evolution by stepping up his distance to half marathon (13.1 miles). In the 2011 Bob Lightburn Classic, a race I personally will never forget, because I competed in that race, Alex and I came to the finish together and ended up in a sprint to the finish line, and he defeated me; he placed 7th and I, 8th. 2013 Placencia Half-Marathon, he placed 7th in that race with a time of 1:30:32. In the BDF 5k race 2013 he placed 2nd, and right after that he ran two 5ks in Belmopan and placed 1st in one and 3rd in the other. The year 2014, he did the BDF 10k this time, and did well. Following that, the Belize Coastal Zone Management 1 Mile Race, which, coincidentally, that race ended up between him and me again; and he won, taking 1st, and I settled for 2nd place. 2015 he ran Placencia again. He then competed in the National Track Meet and got four Silver (2nd) medals – in the 800m, 5000m, 1500m and 4×4 relay; and one Bronze (3rd) in a 4×4 relay. Next, in the Stella Morris 5k Fun Run he placed 2nd. Joseph Carr won that race. Coming down to the most recent, April 4, 2015, the Bob Lightburn Holy Saturday Half Marathon Classic, he ran and placed well. Respect to you, and look forward to seeing big things from your family. I just want everyone to know that, coming up on June 29 is the Belmopan 10k race. I will be updating you and giving you more information in the upcoming weeks. I want to appeal to all busines in Belmopan or anyone who wants to sponsor, to get in contact with me at 665-4949, or Ms. Kerah Eiley, our Belmopan coordinator on our committee. Until next week, have a safe and wonderful week.